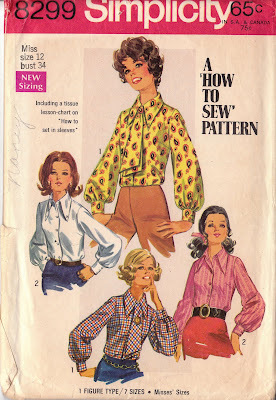 This is so exciting that I want to celebrate by sharing my love of vintage patterns with you....I'm giving away one pattern for each decade from the 1930's to the 1970's. All you have to do to enter is be a follower of this blog and leave a comment below by Thursday the 8th of July. I'll announce the winners on Friday the 9th and will ship your pattern to you anywhere in the world! Just leave a comment on this post by Thursday the 8th of July and let me know which pattern you would like. You can say "all of them" and I will enter you into the drawing for each separate pattern. I'll do a random drawing for each pattern on Friday the 9th and will post the results. Please check back then. I'll ship anywhere in the world. Thanks again for all your comments and support on my sewing journey! And happy sewing everyone!! Me Me for the 40s pattern! Congratulations on reaching 100 followers! What a generous selection of patterns. I adore the forties and fifties patterns the most!Congrats on your 100 followers! Cool! I love old patterns. I especially like the first one from 1938, the McCall 9641. Congratulations, sweetiepie! I'm glad you've taken to this and found such a supportive community. Please don't enter me in the drawing, though, bunny. Congratulations on having 100 followers! I'd love to win any of those patterns! I will take myself out of the running for this drawing, though. I'd rather have the patterns go to someone who is going to do more than just look at the pretty envelope! Congratulations on reaching this milestone! Personally I love your blog so I'm not surprised so many others do too! Please can I be entered for the Advance 6353. I love the 40's and my sewing skills are non-existent enough to ensure I can't resize ... yet. I am absolutely and totally enchanted with the 1938 pattern. I'll post on my blog soon :) Thanks for doing this giveaway. Oooh ooh ooh! Enter me for the 1930s McCall, please! OOh! What a sweet way to celebrate! I'd love the 1940's pattern - it's even in my size! Congrats on 100 followers! I don't want to enter (I've too many patterns already, it would be totally selfish) but I DO want to congratulate you on your 100 followers! You deserve every one of them and I'm glad to see how your blog has grown! hmm.. i wish i may, i wish i might, have this pattern and hope to sew it right... ??? I am gonna go for the 1960's and the 1930's. Congrats on so many followers! Such a good choice in patterns but I expect nothing less from you as you have fantastic taste Debi! Please do not enter me in the giveaway. I just wanted to congratulate you on making it to over 100 followers. You've certainly earned it. I love your blog and everything you make. Great patterns! I would love to win any of them. Thanks for the chance to win and congratulations on your 100 followers! I've been following you on bloglovin, but should probably get into using blogger anyway to make commenting easier. Superior Patterns #9780 is lovely, would go for that one. Congrats on 109 followers (at the time of adding)! You deserve it. Congratulations on your followers; I just became one. Your site is awesome BTW. I love the cute 1960's pea coat adorable. Now to continue checking out the rest of your blog. Congratulations on 100 followers! Yahoo for you! :) I really like Simplicity #4355. Congrats on 100! I would be honored to won any of those patterns! Congratulations on hitting 100! What a fabulous selection of patterns you've put into the giveaway, how can you bear to part with them? 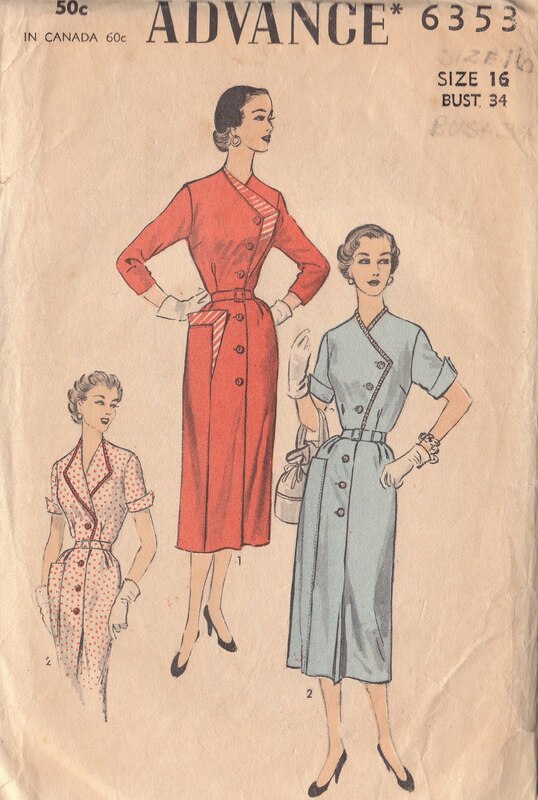 I would love to be entered into the draw for the 1930's pattern and I'm off to post on my blog about it! I went looking at coat patterns on the weekend, and actually your Simplicity pattern #4355 is wonderful! Congrats on reaching the magic 100! Congratulations. I am about to begin vintage sewing and I really like the 30s (the suspender skirt is really sassy) and 60s pattern (lovely coat)! Congrats! 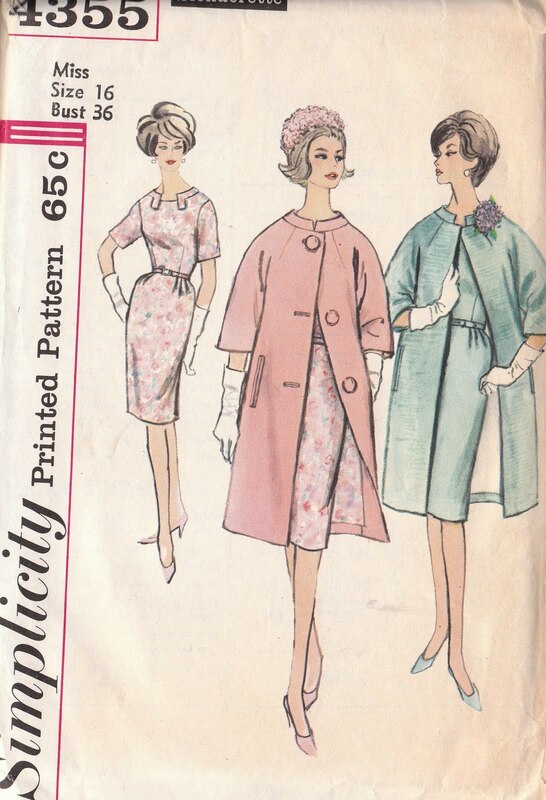 I love the "McCall pattern #9641" and the "Superior Patterns #9780." You have such good taste! I've posted this on my blog as well! Congratulations! I'm getting close to 100 followers myself, so exciting! What a generous pattern giveaway, I'm not entering myself as I wouldn't resize them (lazy, I know!) but just wanted to stop by and say congrats! oh, the 1940s pattern please...its even my size!!! I LOVE the 1940s pattern and its my size so please do include me in the draw! (I do not have a blog so alas I cannot enter) twice. I would love the 1940s pattern! What a great giveaway- I'd love the 30s or the 70s pattern! Ooh!! 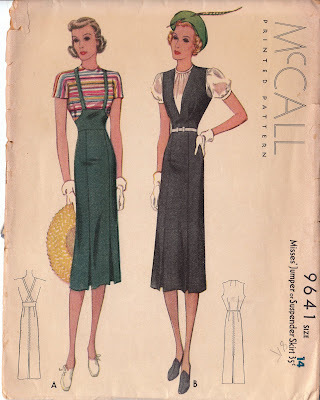 The 1938 McCalls pattern, I LOVE it!!! I might try to draft it anyway! Cheers Debi, congrats on your milestone and thanks for the lovely giveaway! Oh, wow. I'd like to be entered in all of them, please! And thanks for running this giveaway! Congratulations on obtaining 100 followers. I was delighted to recently find your blog. I'm getting back into sewing after a decade's hiatus & love making vintage styles. Please enter me in your drawing & I'm looking forward to learning more about your sewing projects. Ooh, I love them all! I'd like to enter for all but the Superior pattern. (It's tragically too big for me!) Congratulations on your followers and thanks for the opportunity! Keep up the lovely sewing! Thank you for making such a great giveaway! I especially love den 1938 and the 1960-ties pattern. Congrats on reaching 100!! Some day I will get there! I'm fairly new in sewing, but I would love to make some of these!! I would like any of them.. they're all so awesome! Congratulations and thank you! Thanks for doing such a wonderful givaway! I would love any of them so being considered for all would be great, thanks. I'm a newbie at sewing too! I've been admiring your creations on Sew Retro for a while now but you've convinced me to become a follower. I love your Forties style - I've just decided that I need to get into the Forties in a big way. And you're living in Scotland now, which is where I come from (but don't live any more) so I love the glimpses of home I get in your pictures. Please consider me for the 1938 suspender skirt - I'm a B32 and a huge fan of suspender skirts! Congratulations on 100 followers! Your blog is gorgeous, I'm not surprised so many people love it! The patterns you are giving away are all fantastic, but that 1930s suspender skirt is amazing! Congratulations! I love the 50s, 60s and 70s ones! They´re really beautiful! Thanks for the giveaway! Congratulations indeed! I follow already with Bloglovin so hope that counts as a follower? They are all beautiful patterns, it is very kind and generous of you, I would be very pleased to win any of them! You are a sweetie! I'm totally gone for the 1930s or the 1960s. And I'll mention this on my blog tonight or tomorrow. I love your blog. Congratulations on reaching 100 followers. Please enter me for the 1930's McCall's and the 1940's Superior giveaways. What a great giveaway! I've been following your creations on SewRetro and I've finally become a blog follower. I'd love to have either the 1938 and the 1950s pattern. Another giveaway at Created by Chancy. An Amy Butler pattern. Check it out. B. Have so enjoyed following you unofficially, and am now an "Official" follower! Thanks for your generosity in the give away, and in sharing your creativity! Congrats on 100 followers! 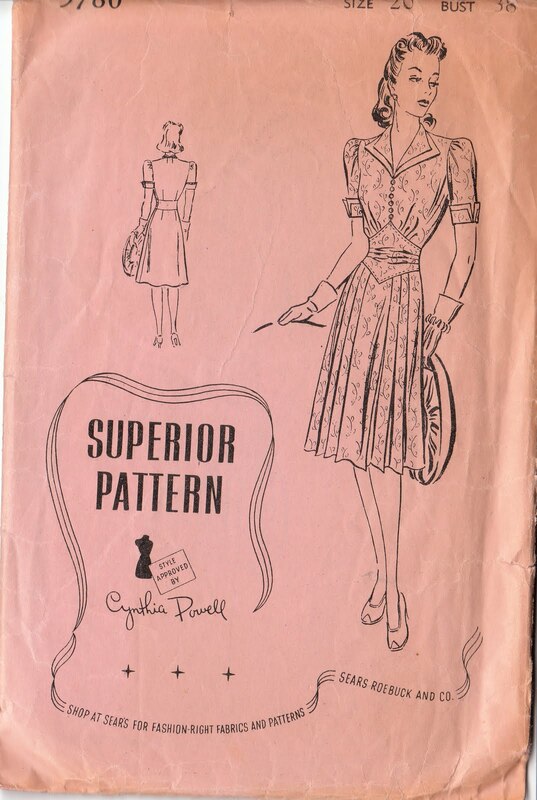 I'm very interested in both the 1940s Superior pattern, and the 1950s Advance pattern! I collect (and gently use, via tracing paper) vintage patterns, particularly 40s and 50s era. 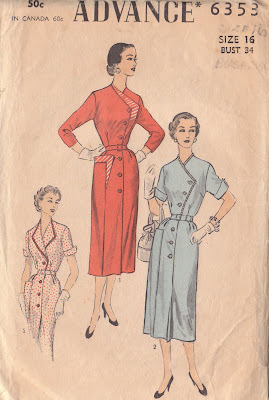 I posted a notice about your giveaway - http://changesblog.blogspot.com/2010/07/sewing-pattern-giveaway-retro-30s-40s.html. Please enter me for the 1930's McCall and the 1940's Superior patterns giveaway. 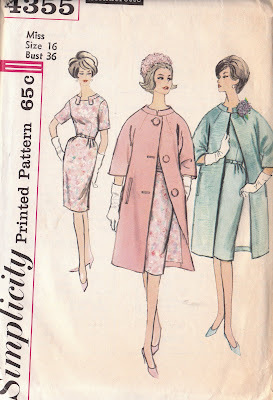 I would love to be entered for the lovely 1940s pattern! Congratulations! I's love to be entered for the 1930's McCall! Thanks! I am so excited to have found your blog. I would love all of the patterns in your pattern giveaway, and it really is the giveaway of the century! I look forward to taking your journey along with you! Wow... they're all so beautiful! I'd love to win ANY of them! :) Thank you for the chance at your giveaway, and congrats on the Followers! 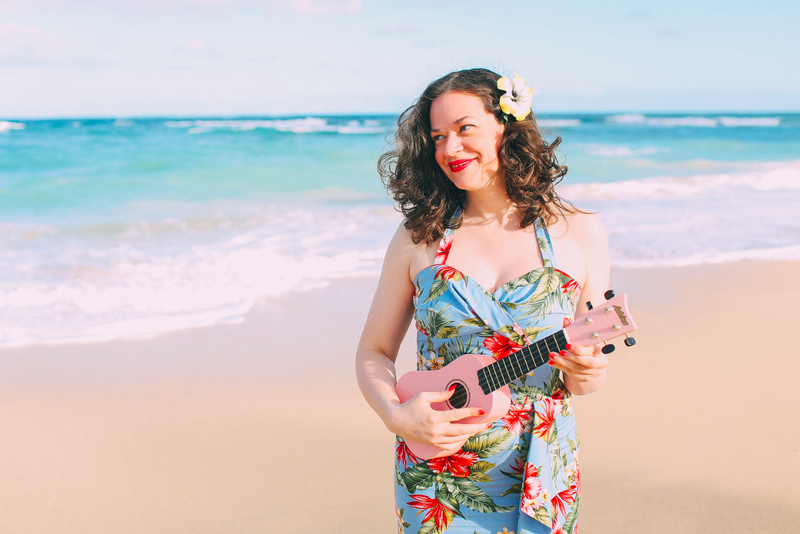 Hello blogger friend! What beautiful patterns--I have added you as a blog I follow. And I would love to be in the running for the 60's pattern. These are all beautiful! Best to you from Wienerdog Tricks--and congratulations on 100 followers! !